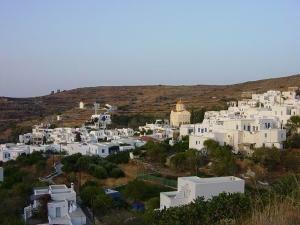 This is the largest and most distant village on Tinos, lying 29 kilometers northwest of Tinos Town. It is a village of very traditional architecture and has been historically linked with marble carving, for which Tinos is well known. There are numerous small carving studios in the village, along with many cafes and other small shops. The central square has a beautiful old plane tree and a marble spring, and is an idyllic setting for an afternoon coffee or a cold drink. There is also a School of Fine Arts located in the village, and two beautiful churches. Relatively new to the village, and situated steps from its center, is the new Museum of Marble Crafts. This outstanding facility, created and sponsored by the Piraeus Bank Group Cultural Foundation, is a unique and fascinating exhibit of the history of marble from antiquity to the present. With audio/visual presentations on quarrying and carving, and an extensive exhibit of machinery, tools, original works in marble, clay models and plaster casts, and one of the largest collections of drawings by noted marble carvers of the past, the museum acts as a comprehensive guide to enhance your deeper knowledge and understanding of this important medium. If you're visiting the island of Tinos, this is not to be missed! The Museum is open year-round (closed on Tuesdays and on National Holidays), and from 1 March until 15 October, you can visit daily from 10:00 to 18:00. During the winter months, the museum closes at 17:00. Admission is 3 Euro for adults; there are discounts for children and seniors. After your visit to the village and the Museum, you can continue down the main road from Pyrgos, which leads to the Port of Panormos, four kilometers away, a delightful seaside harbor with tavernas and fish restaurants.